Are you bored with hard boiled eggs? Yeah, they are dull. Let me introduce you to an old friend. This is a soft boiled egg and it seems our grandparents used to eat these. I hadn't met one until I traveled to Australia with my husband. This is a super way to slow down and enjoy an egg. How do you make them? Well, I get my water boiling and then add my egg for 5 minutes. I found that I can get a consistently perfectly cooked egg this way that isn't too runny. Below I have featured this cool gadget that I found on Amazon.com that makes egg boiling MORE FUN! Yes, they think of everything. You just pop this thing in the water with your eggs and it tells you how cooked they are by changing color. WHOA. Then, there is the issue of spoons. Do you need anything else but a teaspoon? I find that egg spoons (below) are better for getting the entire egg out of the shell. They are also super cute and handy for eating ice cream. Smaller spoons equals smaller bites. 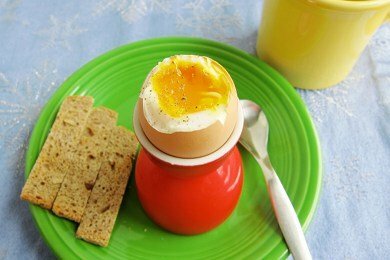 Try a soft boiled egg with a teaspoon before you invest in the egg spoons. You scoop the egg out of the shell with the cute spoons. You do have to crack the egg in a certain way for all of this to work (it takes a couple tries before you become an expert). I found some great instructions here: How To Crack a Soft Boiled Egg. I serve my soft boiled egg for breakfast with a few "soldiers" of Toast. Just cut your 100% whole grain Toast into strips to dip in in the egg. YUM! Do you eat soft boiled eggs? Buy the freshest eggs you can find. Bring a small saucepan of water to a boil and add a dash of salt. Lower egg into boiling water with spoon to keep it from cracking. Set timer for 5 minutes for a runny egg, 7 minutes for a harder one, and 10 minutes for a hard boiled egg. Remove egg from water with spoon and rinse under cold water. Place in egg cup and crack. Enjoy! I haven't had one in forever. When I was little we had them with soldiers too. My mother used to call them dipping eggs. I'm 48 years old and have my grandfather's egg cup in my china cabinet. I will surely be digging it out soon! I have never had a soft boiled yet, crazy huh? I'll have to try it! This certainly brought back memories.. My grandmother use to make these for my brother and I. I just have have to make one for lunch today. Love them! This is a breakfast must in most middle eastern and european households. I usually have mine either before or after a workout. YUM. Hmmm one I'll have to try. I grew up with eggs hard boiled, or scrambled. Now that I'm older I LOVE them over easy, but I can't seem to master the technique. This seems like It'd satisfy my runny yolk fix! Sounds good...The great thing about a hard boiled egg is that you can make them at work (if you work in an office with a stove) without making too big of a mess...The clean up is easy - just dump out the hot water. Soft-boiled eggs are a staple in Euro households. We always have these with my family in Germany, I absolutely love them! On my mom's last trip she brought me back some egg cups so I can finally make them at home. Delish! I have always loved soft boiled eggs. I eat them 1-2 times per week. I enjoy mine over whole wheat toast; like a poached egg but tastier. A little fresh cracked pepper and a dash of ground flax seed makes it extra healthy. 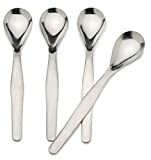 You can also find *tasting spoons* fairly easily these days since "Tasting Parties" are popular. -- Plus the smaller size tasting dishes make it perfect for making portions seem larger than they are. CostPlus/World Market has tasting spoons for $1.29 each and up depending on their style. You can also use Demi-spoons or Tea Spoons (not to be confused with teaspoons!) at most tea and coffee sellers. I like to find the fancier Tea spoons and Demi spoons for eating dessert -- it makes the dessert seem more special and the smaller spoon makes you slow down and enjoy each bite. We love our Norpro Egg Rite Egg Timer thanks for posting! Also, I have egg cups I never use. Typically our soft boiled eggs are done to medium, so no need for fancy cups. Also, Gail that posted above "I love eggs, but sadly can't eat them every day and in trying to keep my cholesterol in check..."
There's no scientific evidence that says that eggs raise the bad cholesterol in blood. This is an old 1980s rumor that stuck. Boiled egg and toasted soldiers! A staple in UK households for breakfast and/or a light evening meal. We draw faces on the eggs too. My mum and dad did it and now I do it for my kids. We also use asparagus to dip, or breadsticks with parma ham wrapped round (you can wrap the asparagus too). My kids call them Dippy Eggs. I am first generation Italian and we ate these soft boil eggs all the time as kids. We had these ceramic ducks to put the egg on and little spoons. This post brought back delightful memories. Def gonna share with my 4 siblings! Thanks! A staple in our house. We serve ours with soldiers of peameal bacon. My youngest loves dipping them in. It's a British thing and we have cute Peter rabbit eggcups and eggcups with feet. We don't have the egg spoon though. As far as cracking it, my father used to say the only way was to slice off the top with a sharp knife, quickly, so that the shell doesn't fracture. Then scoop out the white from the removed part. Any other way leaves a trail of shell everywhere. Oh, the memories. I used to eat soft boiled eggs in a cereal bowl at least twice a week, when I was a kid! Kind of miss that. I love my soft boiled eggs. I put eggs in a saucepan, cover with cold water, and bring to a boil. Then I turn off the heat completely and let them sit for four and a half minutes. Perfect gooey eggs!